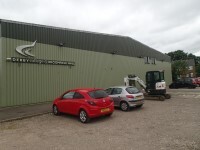 Services / facilities within the building include a Equine Centre. 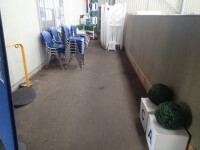 Related link Equine Centre Indoor Riding Block. There are also events run at the weekends. Please contact the venue for more information. Broomfield Hall Campus is located to the North East of Derby between Breadsall Morley. The Campus is easily accessed via the A38, the A61 and the A608. The Campus Postcode for Sat-Nav users is DE7 6DN. 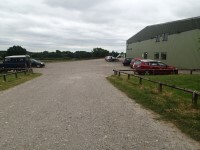 The Equine Centre is accessible via the Main Campus but also has its own entrance around 550m towards Morley Village. There is an open-air car park which is loose chippings and concrete. 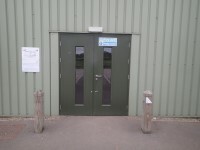 There are 2 Blue Badge bays directly outside the Main Equine Centre entrance. Parking is free for all users. The Campus is on the H1 bus route and there are bus stops directly outside the Main Campus entrance. This is approximately 550m from the entrance to the Equine Centre, although access can also be gained through the main campus site. The nearest train station is Derby and there are several taxi services which run from there. Alternatively you can take the H1 bus which drops off directly outside the campus main entrance. To see more information on Inclusion and Support please click here (opens new tab). Telephone Number: 0300 123 7890 ext 1208. The Inclusion and Support Service at Derby College offer support on all college sites in-class, outside of the classroom, with exams and assessments and in the wider college environment. To see more information on Student Services please click here (opens new tab). Telephone Number: 0800 028 0289. To see more information on How To Apply please click here (opens new tab). To see more information on Accommodation for Learners please click here (opens new tab). 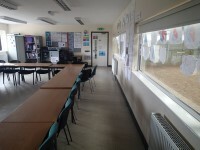 The car park can be used by staff, students and visitors. 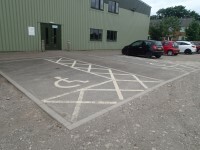 The dimensions of the designated parking bay(s) are 250cm x 540cm (8ft 2in x 17ft 9in). The nearest designated bay is 5m (5yd 1ft) from the Equine Centre entrance. 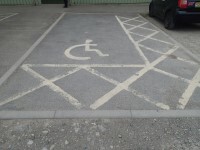 The route from the car park to the building is accessible to a wheelchair user. 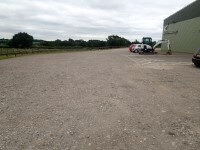 The surface of the car park is loose chippings and concrete. 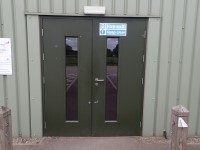 You are on Outside Access (Classroom Block Entrance). Skip to the next section. 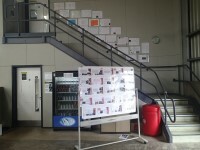 This information is for the entrance located at the front of the building, facing the car park. 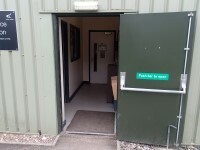 You are on Outside Access (Equine Office and Reception Entrance). Skip to the next section. This information is for the entrance located to the right of the building. 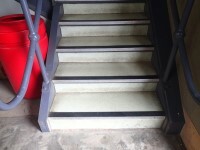 The width of the door opening is 91cm (2ft 12in). 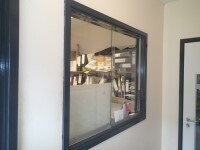 You are on Reception (Equine Office and Reception). Skip to the next section. Equine Office and Reception is located on the left as you enter the Equine Office and Reception entrance. 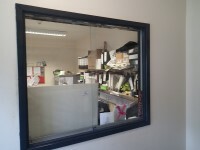 The desk is 1m (3ft 3in) from the Equine Office and Reception entrance. 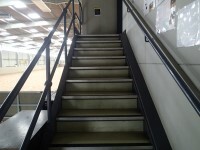 The stairs are located to the right of the Equine Centre entrance. 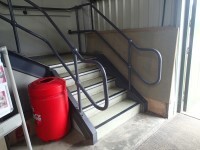 The stairs are approximately 1m from the Equine Centre entrance. 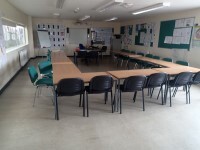 The area(s)/service(s) on the floors which are not accessible is/are classroom 1. You are on Accessible Toilet (Classroom Block). Skip to the next section. 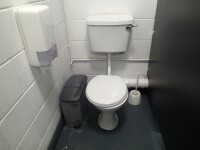 This accessible toilet is approximately 3m (3yd 10in) from the Equine Centre entrance. 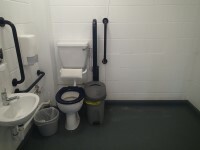 This accessible toilet is located to the left as you enter the Equine Centre entrance. The width of the accessible toilet door is 87cm (2ft 10in). 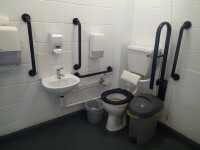 The dimensions of the accessible toilet are 240cm x 250cm (7ft 10in x 8ft 2in). The lateral transfer space is 175cm (5ft 9in). There is a/are non-infectious waste and open waste paper bin disposal units. 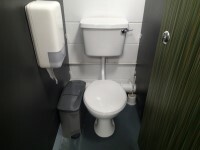 The height of the soap dispenser is 98cm. You are on Standard Toilet(s) (Classroom Block). Skip to the next section. 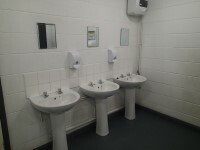 There are male and female standard toilets facilities on the ground floor. A female standard toilet was surveyed. 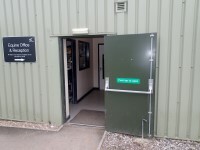 The toilet surveyed is located to the left of the Equine Centre entrance. There is a male standard toilet in the same location. 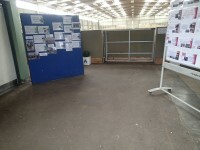 The standard toilet surveyed is approximately 14m from the Equine Centre entrance.